Time moves on and a week ago Ulster’s Darren Cave was sharing views on social media about Ireland’s U20 Grand Slam Six Nations championship win back in 2007. The class of 2018 became the first Irish side since then to achieve the feat and Cave was a member of the last squad as he was starting on his professional career. This week the questions were focused on what Cave might do at the end of the current season with Ulster when his contract is due to end. From that point, there is still nothing to reveal from the 11 times capped Irish international. The most capped player currently in the Ulster squad at 223, looks back with good memories to that Slam in 2007. He made his debut with the Ulster senior squad in the same season. For any side to achieve a Grand Slam in the Six Nations - you only have to remember the scenes last year at Twickenham when Ireland’s senior side beat England to complete the perfect campaign. And it is no different at U20 level, achieving the Grand Slam is something which only happens now and again. “It’s big deal for Irish rugby, but for those guys it’s an incredible thing. I remember it very well. “I’ve a framed jersey with all the squad have signed it, the management have signed and my parents were at all five games and had the five ticket stubbs underneath it. “At the time it was the biggest thing that it was the biggest thing going. As it transpired I was fortunate to go on and play international rugby, so looking back it probably was not as big as it felt it was at the time. “I was looking at the picture and there were 23 players in it, Sean O’Brien was missing, 19 of that squad were or went on to play professional rugby. 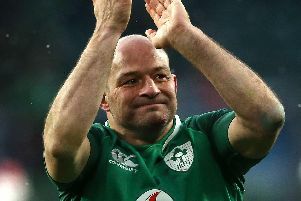 Ireland and Ulster captain Rory Best has announced he will retire from professional rugby after the World Cup in Japan. Does it seem like 12 years ago? As for the immediate future, Cave admits he will have to start giving it some really serious consideration, but he has still not made a decision and did not want to speculate on anything too much. “I have not made a decision on what the future holds for me. It is all aligned anyway regardless of what Darren Cave is doing at the end of next season or this season. “It all ties back to Ulster finishing strong this season, if I am not playing rugby next year then I want to go out on a high, and if I am playing then I want to have been part of this team that has built this, won that or nearly won this, or whatever it was. In terms of the regular PRO14 season, this could potentially be Cave’s penultimate home game - but he does not think about it. “Not really. Like there are times when in the Dragons or Zebre changing room after the games when you think why would I ever walk away from this, I always presumed I would play until I was 35 or 36 and I would retire injured of just could not physically hack it anymore,” said the 31-year-old. “I suppose I have changed my tune a little bit on that, but I have not fully made a decision. “But there are times when you are in a changing room like that, how could I ever give that up. Asked if he would consider a move to somewhere else, Cave basically dismissed it. “I think again it is something I have not made a decision on so I don’t really want to speculate too much. Whatever the future may hold, there is no doubt a player of Cave’s experience is more than useful to have around the Kingspan, particularly when there are so many exciting youngsters currently coming through in the backs. And in some respects there is that added responsibility on him. “I suppose there is in a way, and for me it’s something that I enjoy,” admitted Cave. “Young guys bring so much enthusiasm and speed. It probably suits them having me, but it’s vice-versa as well as for me to have guys that I get the ball in their hands and try for second touches, create a bit of space for, and when they do get half a yard of space, finish off. Cave has been handed another start this evening at Kingspan Stadium as the Guinness PRO14 returns after a two week Six Nations break and Ulster face Southern Kings (kick-off 5.30pm). Next week the focus is on Europe, but Cave insists it is all about the Kings at the minute.